Steve Mc Queen's Rolex Ref. 5512, Rolex, Oyster Perpetual, Submariner, 660 ft = 200 m, Superlative Chronometer Officially Certified, Ref. 5512/5513. Made in 1967. Fine, center seconds, self-winding, water-resistant, stainless steel diver?s wristwatch with a stainless steel Rolex Oyster bracelet. Accompanied by a letter of authenticity from Jimmy Brucker. C. Three-body, polished and brushed, screwed-down case back and crown, graduated bi-directional revolving black bezel for the decompression times, Triplock winding-crown protected by the crown guard. D. Black with luminous round, triangular and baton indexes, outer minute division. Luminous steel skeleton hands. M. Cal. 1570, rhodiumplated, 26 jewels, straight-line lever escapement, monometallic balance adjusted to five positions and temperatures, shock absorber, self-compensating free-sprung Breguet balance spring, Microstella regulating screws. Dial, case and movement signed. Diam. 40 mm. Thickness 14 mm. C. Three-body, polished and brushed, screwed-down case back and crown, graduated bi-directional revolving black bezel for the decompression times, Triplock winding-crown protected by the crown guard. D. Black with luminous round, triangular and baton indexes, outer minute division. Luminous steel skeleton hands. M. Cal. 1570, rhodiumplated, 26 jewels, straight-line lever escapement, monometallic balance adjusted to five positions and temperatures, shock absorber, self-compensating free-sprung Breguet balance spring, Microstella regulating screws. Dial, case and movement signed. Diam. 40 mm. Thickness 14 mm. After a successful foray into British motorcycle sport, Bud Ekins moved to California and ran a very successful Triumph dealership. He had become something of a hero to Hollywood?s young movie actors, who would often hang out at his shop. One of those actors was Steve McQueen. When McQueen bought an off-road motorcycle, Ekins, then the absolute master of Southern California off-road motorcycle racing, coached him in bike control on the desert washes and fire trails of the area. McQueen, in turn, got Ekins stuntman jobs in the film industry. They quickly became very close friends and their attention turned to racing and collecting cars and bikes. In 1970, James F. Brucker (an avid car collector) opened the ?Movie World Cars of the Stars Museum? in Buena Park, with his son Jimmy. The Bruckers displayed 150 vehicles at Movie World Museum and would regularly rent cars from their collection to Hollywood producers for use in the making of motion pictures. The Bruckers hired Ed ?Big Daddy? Roth (a famous custom car builder) as art director for the Museum and subsequently Von Dutch (a famous motorcycle mechanic, pin striper and metal fabricator). Bud Ekins had several motorcycles on loan to Movie World Museum and he would stop by the Museum from time to time to check up on the bikes and see if there were any interesting motorcycles available. In 1975, Ekins introduced Jimmy Brucker to Steve McQueen. Once McQueen discovered Movie World Museum and the car and motorcycle devotees that surrounded it, he started hanging out there on a frequent basis. At the time, Von Dutch was working and living in the back of the Museum and McQueen utilized Von Dutch?s mechanical skills to keep his bikes operating in top condition. Jimmy Brucker and Steve McQueen became good friends during this period and increasingly McQueen would consult Brucker on cars, guns, antiques and other items for his growing collection. Since both McQueen and Brucker were avid collectors, they would frequently trade collectibles with each other. According to Brucker, Steve McQueen was a man of simple tastes and only collected items that he truly appreciated without regard to its popularity, he was neither a showoff nor speculator. Eventually, McQueen put Jimmy Brucker in charge of his automobile collection. McQueen gave Brucker a Power of Attorney for vehicle titles, so that Brucker could buy and sell cars for his collection without McQueen having to be present for the transfer. In 1977, McQueen came by Movie World with a heavy beard he had grown for the movie ?Enemy of the People.? Brucker gave McQueen a Von Dutch engraved rifle and knives from his collection and McQueen got so excited that he took off his stainless steel Rolex Submariner from his wrist and gave it to Brucker as a gift. Brucker and McQueen took a picture together that day, which was rather rare since McQueen seldom allowed anyone to photograph him in the last years of his life. Several months later, Jimmy Brucker and McQueen chartered a small plane to Idaho in order to view a ranch he was considering buying. On the way McQueen asked for the watch back explaining that it was a gift from someone and that he did not want to offend that person by having given it away. Brucker obliged and returned the watch. The trip aboard the single engine Cessna was also memorable because they hit an ice storm and nearly did not make it. McQueen had a driver pick him up in Idaho and shuttle him back to Los Angeles. Following that incident, McQueen vowed to learn to fly his own airplane. McQueen wore the watch on-screen in the movies ?The Hunter.? In 1979, Steve McQueen moved to Santa Paula, California, a sparsely populated farm community a few hours north of Los Angeles. McQueen made good on his promise to learn to fly an airplane and purchased a hangar at the Santa Paula airport. The hangar became a focal point of his life and he spent most of his time living in the hangar. Many of McQueen?s cars and bikes were stored in the hangar together with a growing collection of antiques, signs, posters, furniture, vintage toys and art. The Brucker family owned a large fruit packing warehouse across from McQueen?s Hangar at Santa Paula and most of their collection from Movie World Museum was moved there in 1979, including Von Dutch himself, who lived in the warehouse. Jimmy Brucker spent time with McQueen in Santa Paula and McQueen continued to collect, and stored and displayed his collection at his hangar. 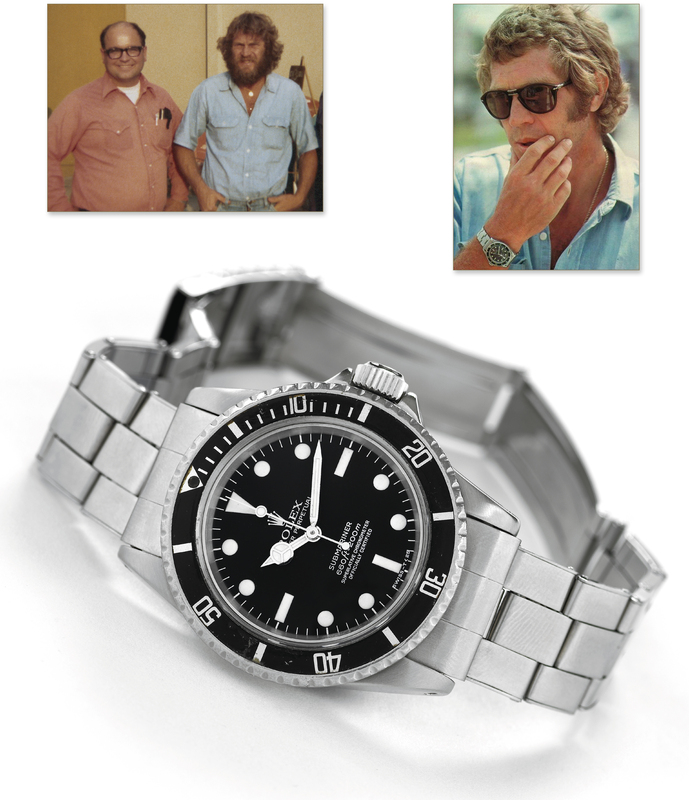 In the spring of 1980, McQueen returned to Santa Paula and stopped by Brucker's warehouse and gave Jimmy Brucker back the Rolex Submariner. Brucker did not see him many times after that and it seemed to him that McQueen was trying to come to terms with his illness. Upon his untimely death, McQueen bequeathed his airplane Hangar at the Santa Paula Airport to Jimmy Brucker. Thereafter, Steve McQueen?s attorney, Ken Ziffren, contacted Jimmy Brucker to assist in the liquidation of his estate. In 1984, Brucker oversaw the McQueen Estate auction at the Imperial Palace in Las Vegas, which was highlighted by the sale of McQueen?s XK-SS Jaguar for a world record price. In the ?Brucker Brothers? Kustom Kulture Collection? auction in May of 2006, Jimmy Brucker sold a few items that he received from McQueen including the Von Dutch custom engraved locks for the airport hangar, McQueen?s handprints in a cement block and his keys to the Beverly Hills Hotel Suite. The present lot remains one of the last items that Jimmy Brucker received from Steve McQueen.